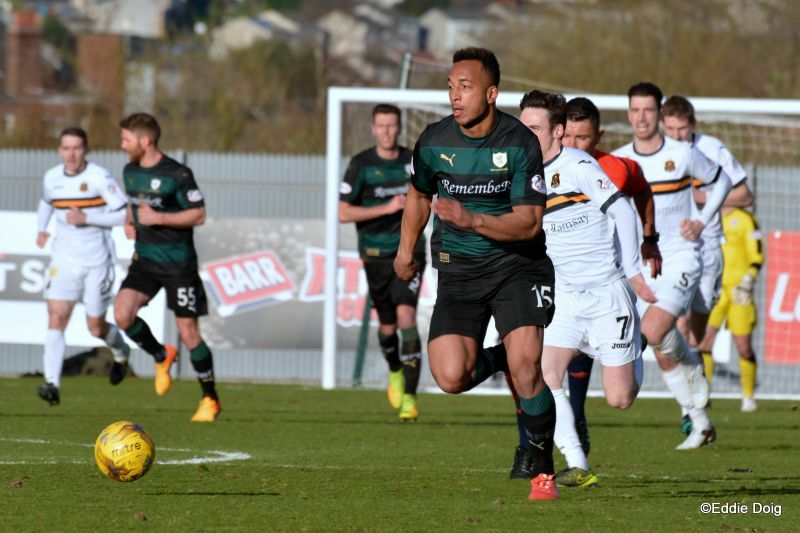 Raith Rovers made it nine games unbeaten, with a hard-fought but deserved 3-2 win over Dumbarton. 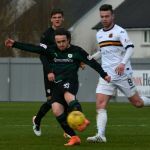 Manager, Ray McKinnon made three changes from the team which confirmed its place in the play-offs with a win at Palmerston Park last week. 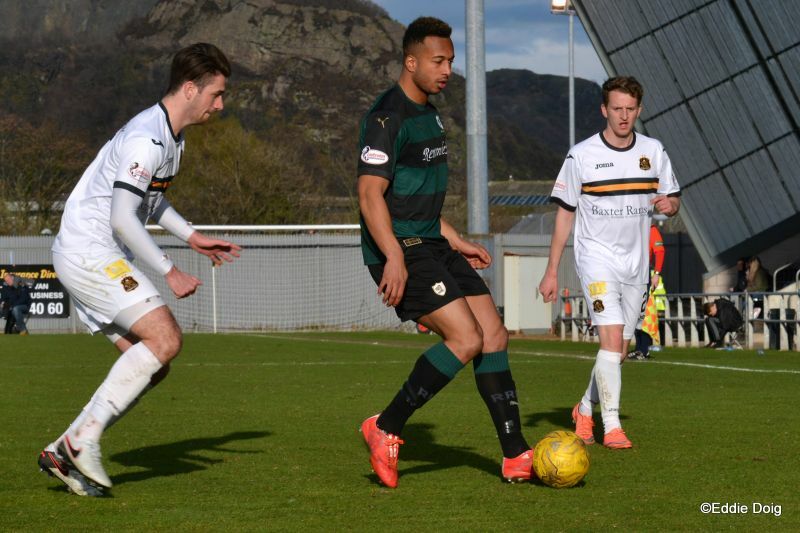 Grant Anderson and Ross Callachan returned to the midfield, while Harry Panayiotou partnered Ryan Hardie up-front. 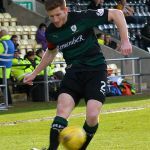 Making way were midfielders Scott Robertson, Louis Longridge and James Craigen, and while Robertson missed out altogether, the latter two were both named on the substitutes bench. 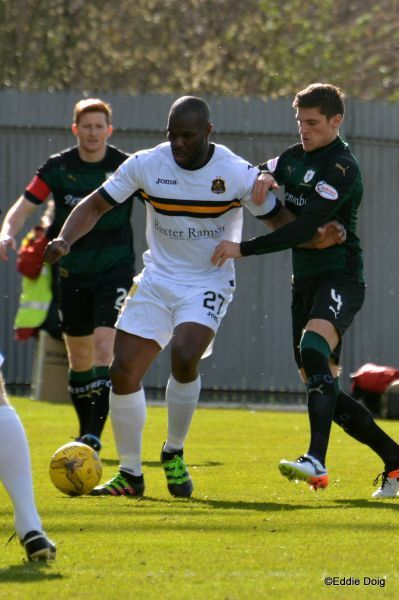 For Dumbarton, former Raith striker Christian Nade led the line up front, with the Frenchman hoping to keep up his superb form, which had seen him score seven times since joining the Sons in January. 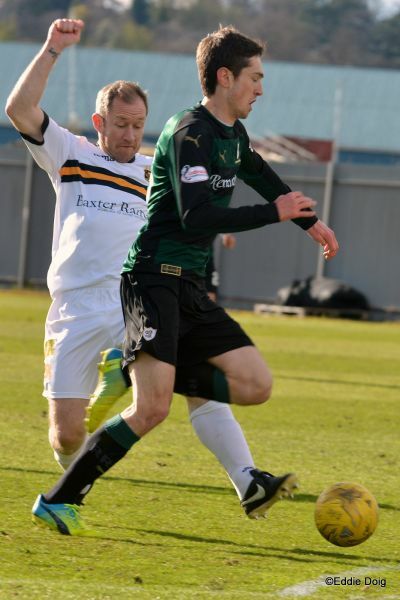 However, it was Nade’s strike-partner, Garry Fleming who tested the Rovers defence first, pouncing on some hesitation from Raith in the middle of the park and driving into the gap, before teeing up Grant Gallagher on the right. 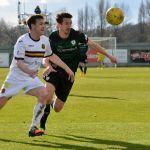 His driven cross was stopped by Rory McKeown, and despite loud protestations that it had caught his hand, referee, Nick Walsh waved play on. 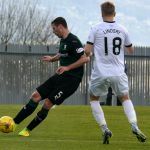 The opening spell was full of huff-and-puff but few clear-cut chances, with Raith creating their first opening after nine minutes, although it probably fell under the category of half-chance. 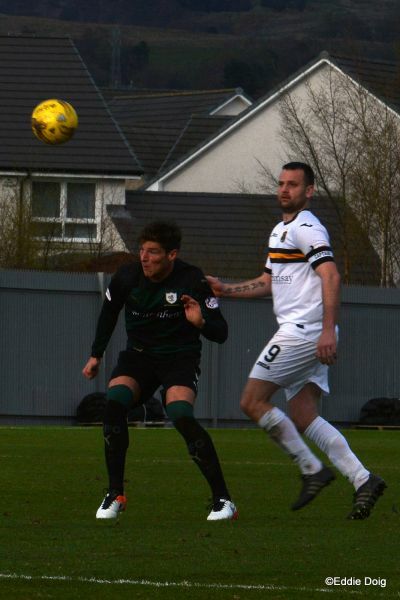 A long-throw from McKeown was flicked on inside the area by Craig Barr, and although Panayiotou was well placed at the back-post, he couldn’t quite get purchase into his header, drifting his effort over. 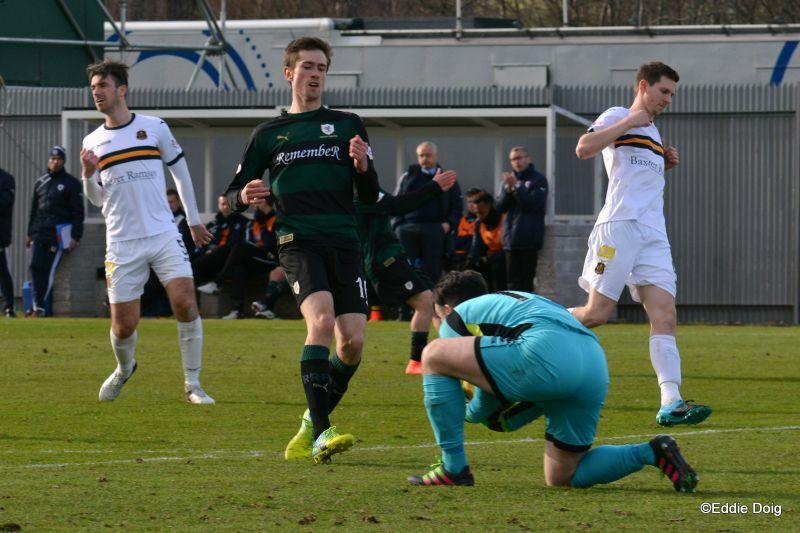 Rovers were made to pay for their sluggish start, as within a matter of minutes, the home side took the lead. 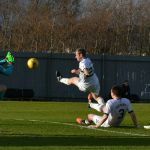 Jamie Lindsay swept the ball out wide to Tom Walsh, and with Jason Thomson unable to prevent his cross, Nade was allowed time to bring the ball down on his chest, and from inside the six-yard-box, toe-poke the ball past Kevin Cuthbert. 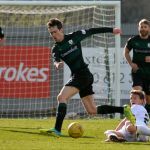 Despite the setback, Raith almost hit back within five minutes, with a move that was started and almost finished by Ryan Hardie. 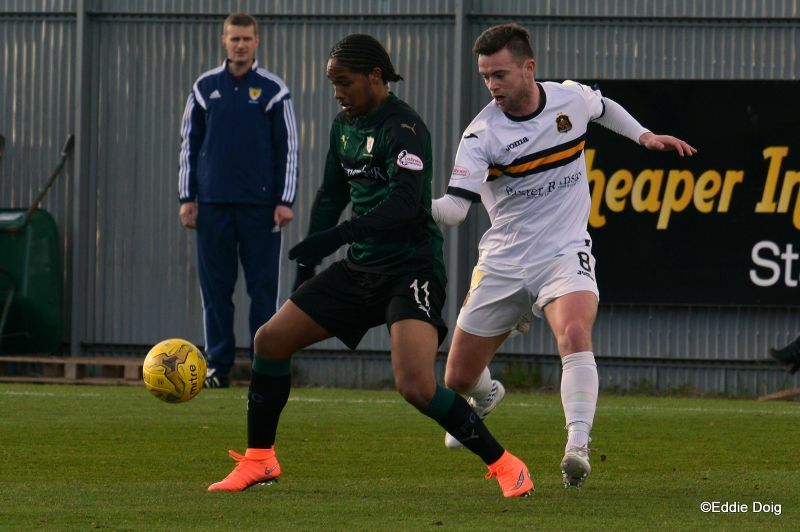 Winning possession deep in his own area, he exchanged passes with Anderson, before making a bee-line towards the Dumbarton goal. 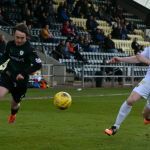 After drifting past three players in the process, the chance appeared to open up for him, but Jamie Ewings was equal to his firm drive. 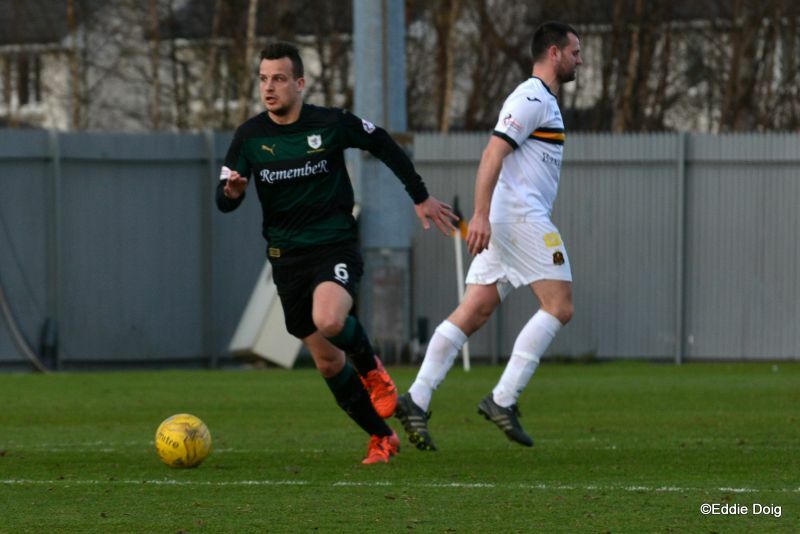 Steven Saunders had been a thorn in Raith’s flesh during the 3-3 draw back in November, with the defender scoring twice, and he almost scored in this one with a quarter of the game gone. A Walsh corner was headed on towards the back-post, and despite Saunders having time, he got his volley all wrong took a fresh-air swipe. 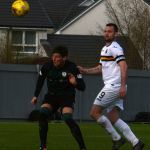 Rovers were struggling to make their mark in what was a reasonably evenly matched half, although Lewis Toshney almost took advantage of Jamie Ewings dash from goal just before the half-hour was up. 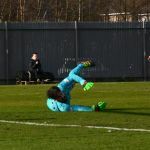 The goalkeeper elected to spring to the edge of his area to punch clear a cross, and although Toshney’s lob was accurate, his attempt was headed off the line. 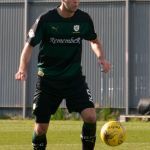 Grant Anderson was the first Raith player to have his name etched into the referee’s jotter with ten minutes of the half-remaining, when he was adjudged to have simulated contact after going down in the penalty area following a challenge from Mark Docherty. 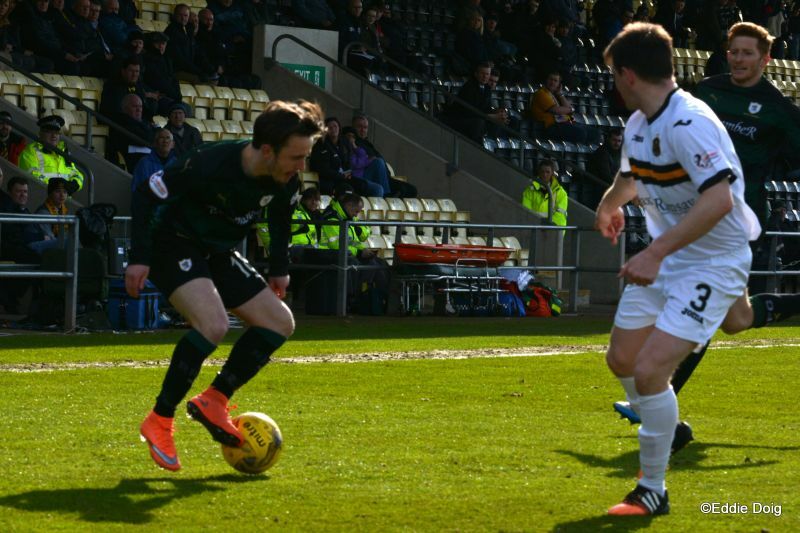 The final chance of a disappointing opening period fell to McKeown, and while the young left-back scored one of the goals of the season against Morton in February, he failed to recreate his finish from a similar range here, flashing a shot well over from distance. 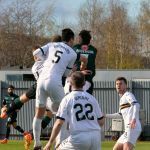 Perhaps sent out with a flea in their ear, the Rovers players started the second-half strongly, and were level within five minutes of the restart. 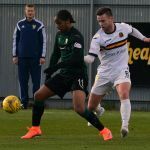 Panayiotou did well to flick the ball on to Connolly in midfield, and the diminutive playmaker slipped a pass through to Hardie, who had managed to get in behind the Dumbarton back-line. 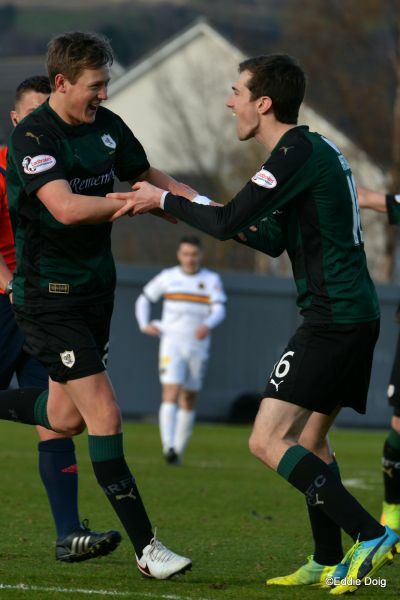 Steadying himself, the on-loan striker calmly slotted past Ewings for his fifth goal in a Raith jersey. 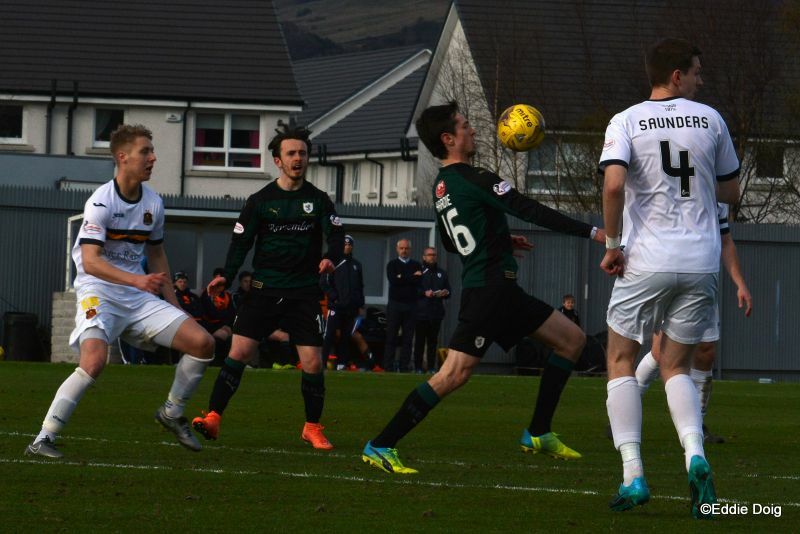 Despite the bright start to the half, Rovers failed to seize the initiative, and Ray McKinnon made his first change after an hour, swapping in James Craigen for Anderson, and within seconds, Rovers were in front with an incredible strike. 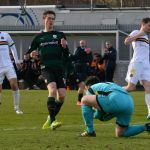 Connolly brought the ball down 25-yards from goal, and he lashed an unstoppable shot past Ewings and into the top-corner to give Rovers the lead. 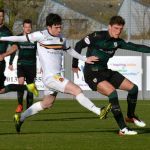 Dumbarton may have felt slightly hard-done by based on the way the match had flowed up until that point, but with Rovers now in the lead, they started to dictate matters to their whim, eventually extending their advantage with twenty minutes remaining. Again, Connolly was the creator, picking up the ball in the middle of the park, before cleverly playing in Craigen, who sidefooted the ball calmly past Ewings and into the bottom corner from just inside of the area. 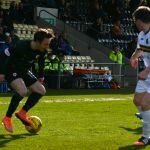 While the goal put Raith in the driving seat, nothing could be taken for granted, especially considering Rovers squandered a three goal lead the last time they visited the venue. 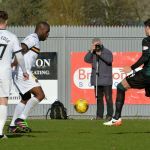 They were within inches of grabbing another goal almost instantly, when Thomson swung a great cross into the area towards Panayiotou, but the forward could only glance it wide. 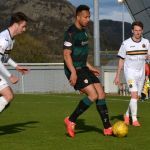 It was one of his last contributions to the match, with the forward making way for Joel Thomas with fifteen minutes to go. 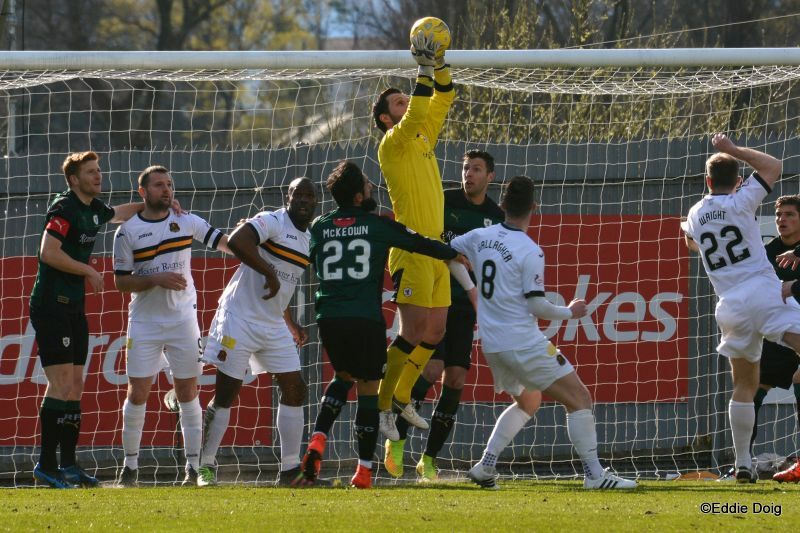 As the match drifted towards its conclusion, Dumbarton appeared to sense the game was up, with the majority of the game heading toward Ewings rather than Cuthbert, and the Sons keeper had to be alert to stop a Craig Barr header which was sneaking in at the back post, following a Connolly set-piece delivery. 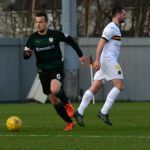 With a little under ten minutes remaining, Ross Matthews replaced Kyle Benedictus, possibly with an eye on the fact that the centre-half had just had his name taken by the referee. 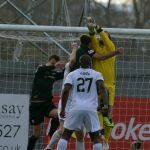 Still Rovers swarmed forward, and Ewings again had to be alert to block a Thomson drive, after an initial cross from Connolly was partially cleared to the edge of the box. 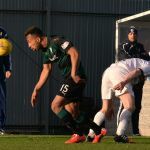 Despite looking comfortable, the match suddenly and disconcertingly from a Raith point-of-view, started to resemble the 3-3 draw from November. 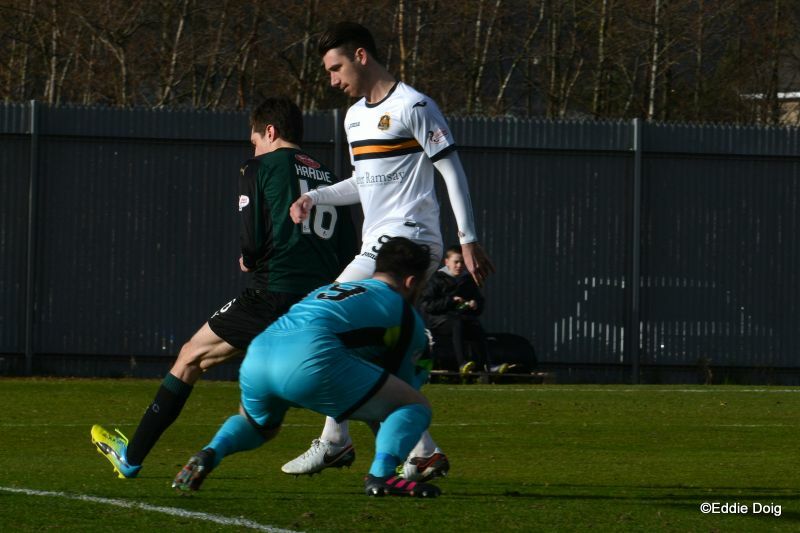 With two minutes remaining, a Dumbarton corner was swung into the area, and that man Saunders was once again on the end of it, crashing a header past Cuthbert to set up a fraught couple of minutes. 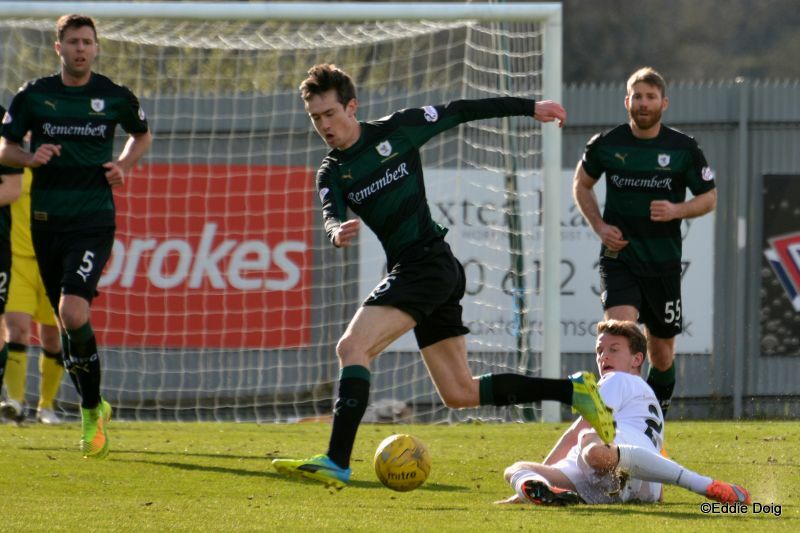 Rovers are made of stronger stuff right now however, and they held on to close the gap to third place Hibernian to just two points. Welcome to the Cheaper Insurance Direct Stadium, it's sunny in the car park but it's Baltic in the stand. Robertson not in the squad but Anderson starts. 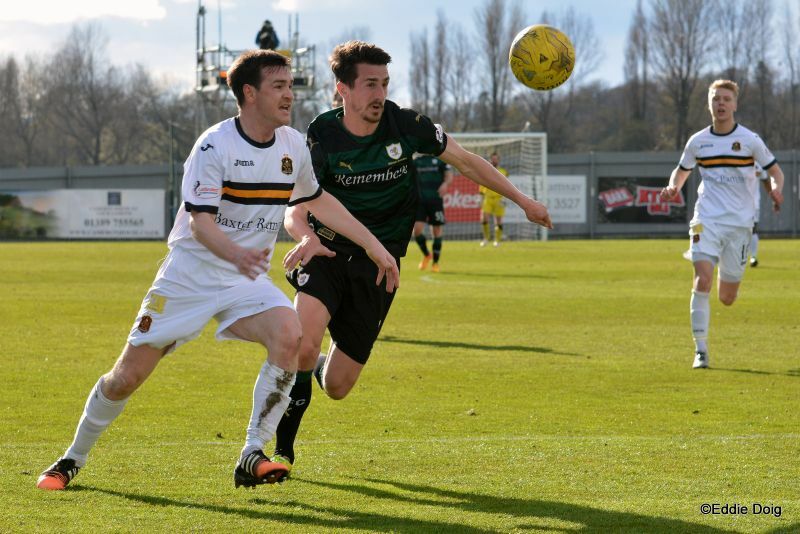 2/2 Dumbarton 325, Raith Rovers 721. 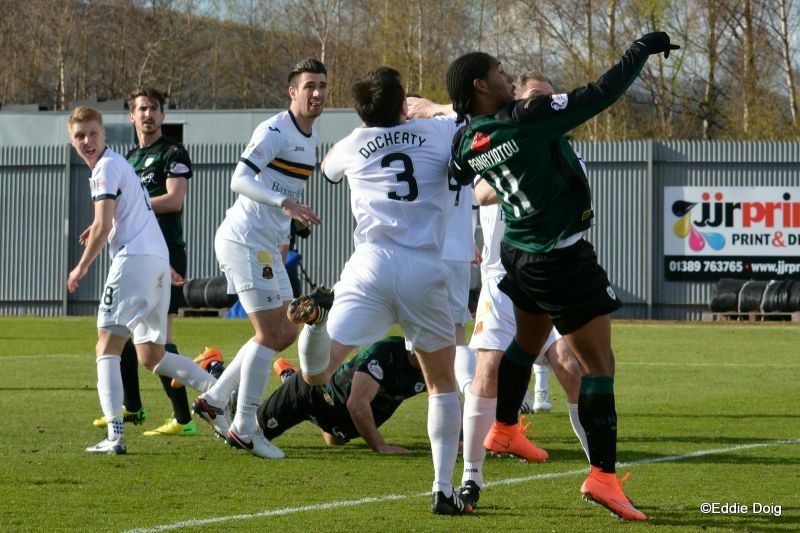 In those matches Dumbarton have 11 points and Raith have 23. 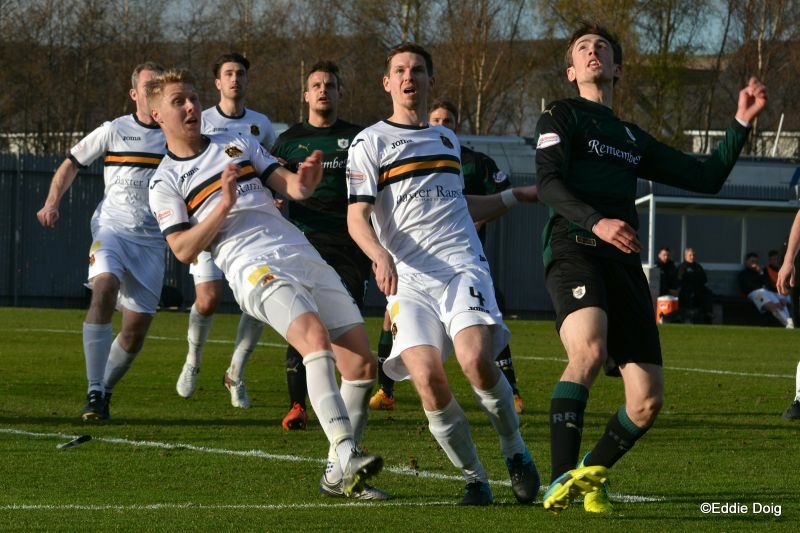 Head to Head in the Championship Rovers are 542 against Dumbarton. 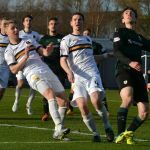 The last match at Dumbarton wasn't short on excitement, ending 3-3 after the Rovers were cruising 0-3 with 10 minutes to go. The PA announces that some clown has left their car windows down, that'll be me then, back in a minute. Rovers kick off towards the Glasgow end. 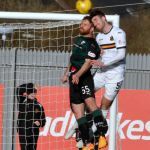 Connolly and Thomson getting in each others way. 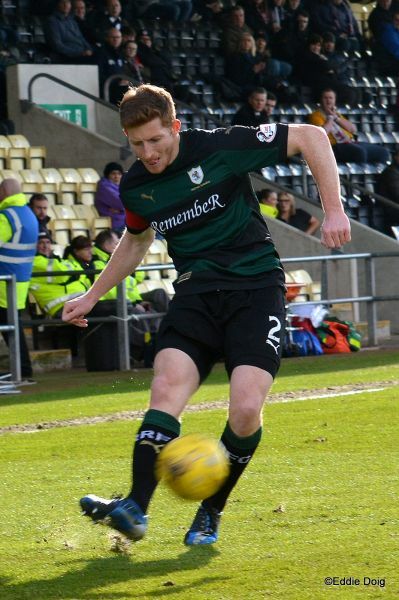 Connolly testing Ewings with a shot from 20 yards. 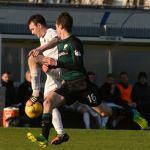 Callachan leaving Nade and Gallagher in his wake. Anderson squandering a cross as he sends the ball towards the corner flag. 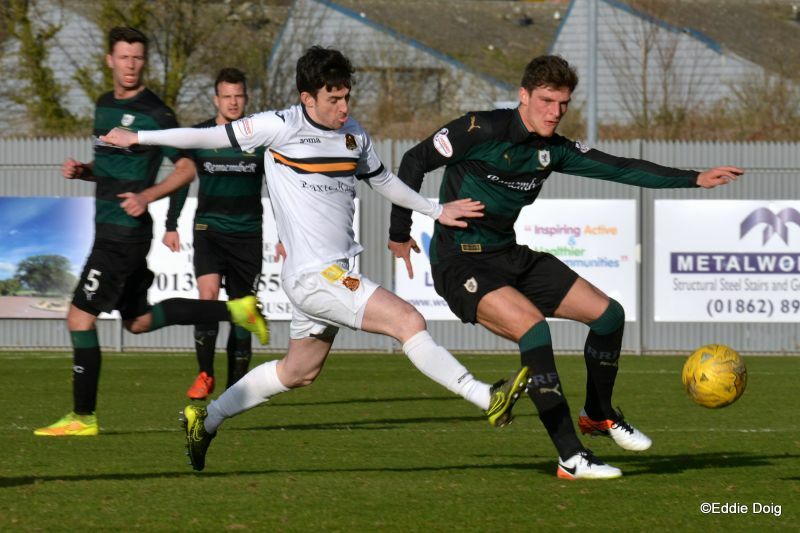 McKeown with his trademark long throw finds Harry who heads just over the bar. 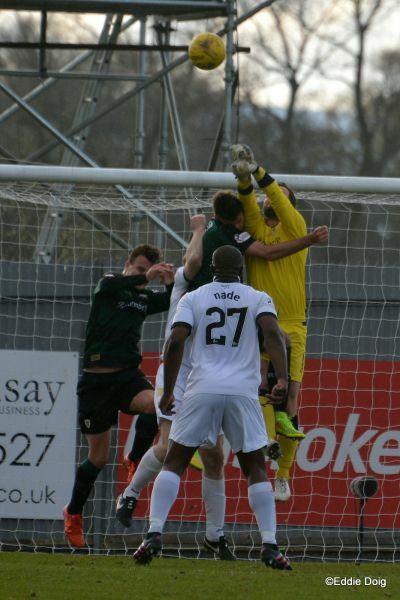 In a move which saw Toshney surrender the ball to Lindsay, Cuthbert recovered by saving from Routledge. 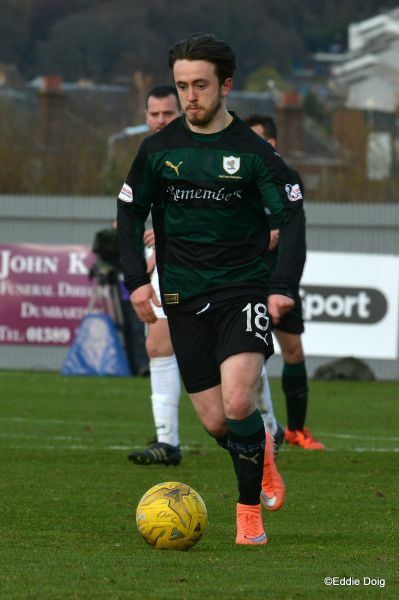 Connolly from 20 yards hits a left foot shot past the post. Christian Nade from 4 yards. 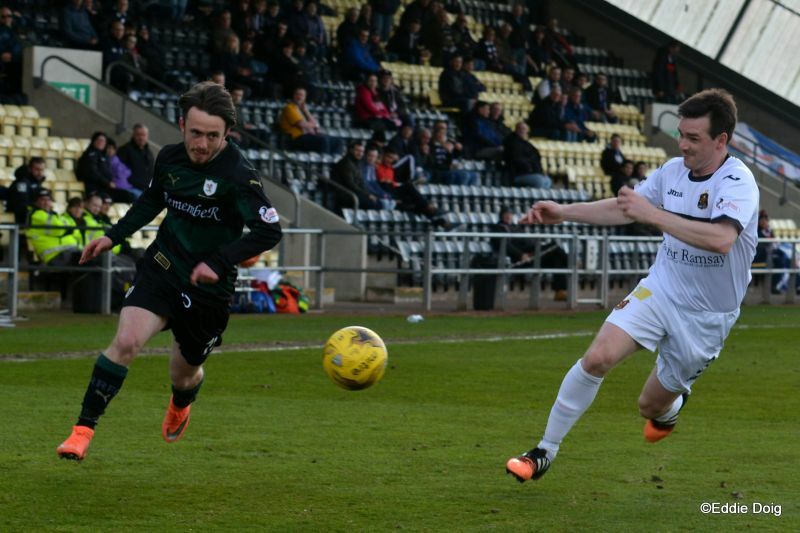 Ryan Hardie with a solo run beats three players but could only hit the ball off Ewings. 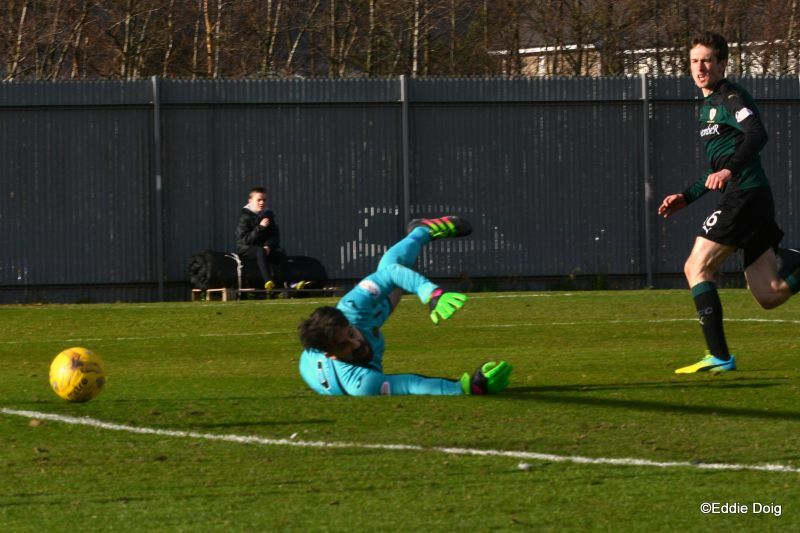 Ewings diving low to the near post to deny Anderson. Tom Walsh coming close at the other end. 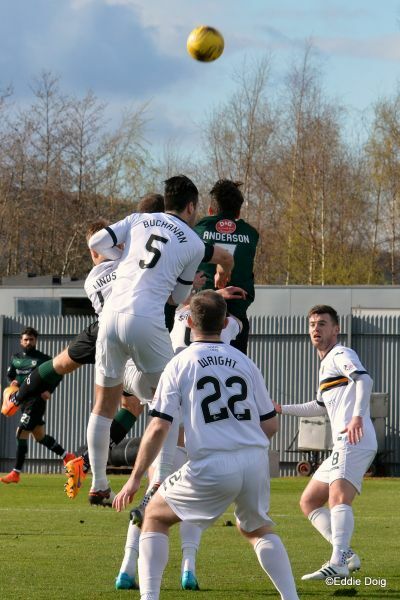 Connolly looks on hopefully as his looping header goes over the bar. That's the first quarter over and the only thing separating the sides is Nade's goal. 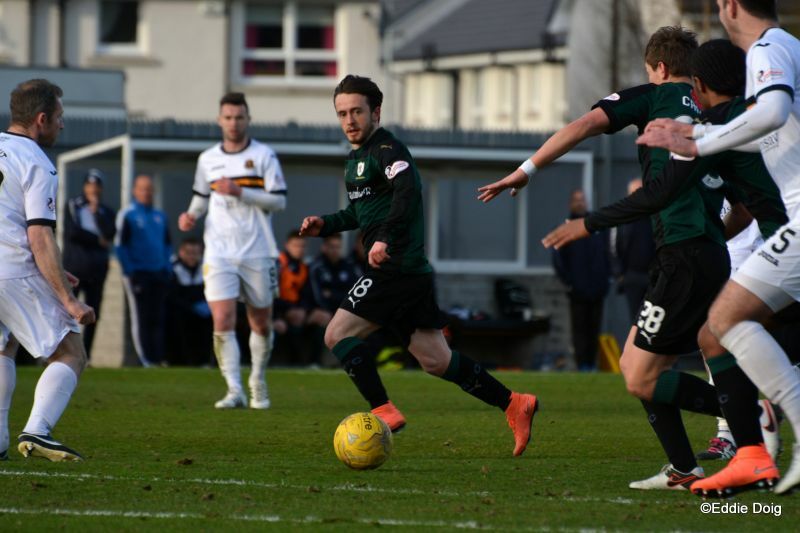 Gallagher torments the back four. 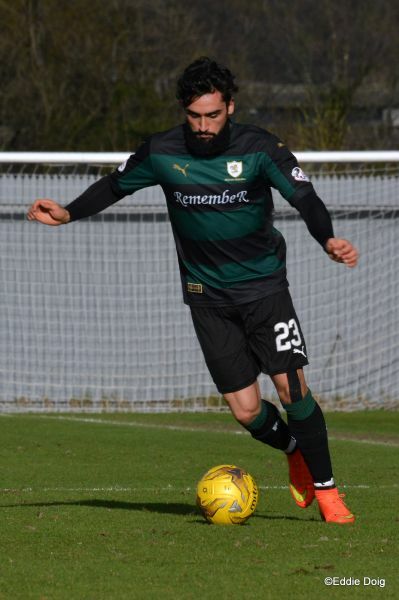 Toshney hits a speculative shot from 25 yards. Too many high balls getting played, the wind making delivery a lottery. 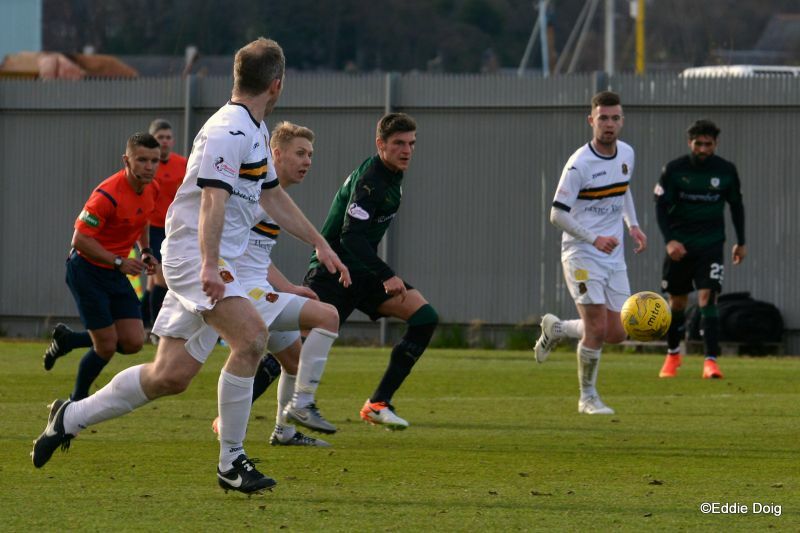 Harry heads the ball into the path of Hardie, Docherty intercepted for a corner. Anderson is pole axed in the box by Docherty, Mr Walsh waves on play. Walsh hits a ball into the area but there are no takers. 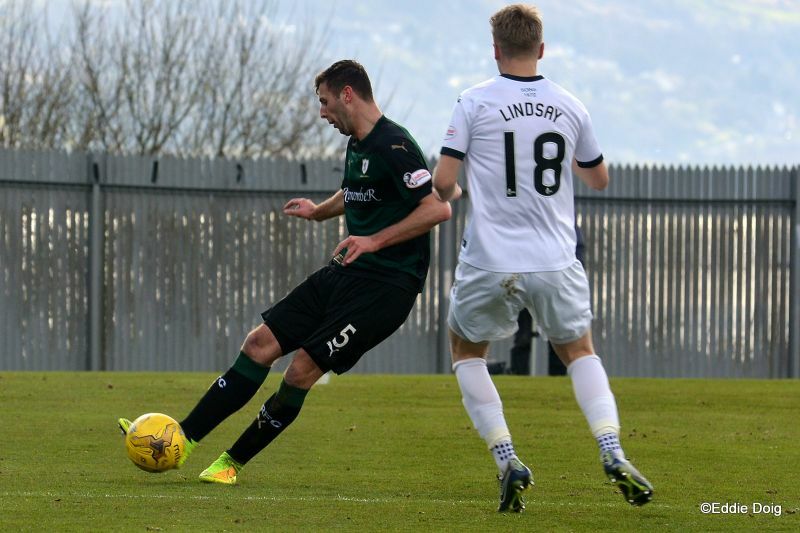 Callachan threads the needle but the pss to Hardie is too powerful. 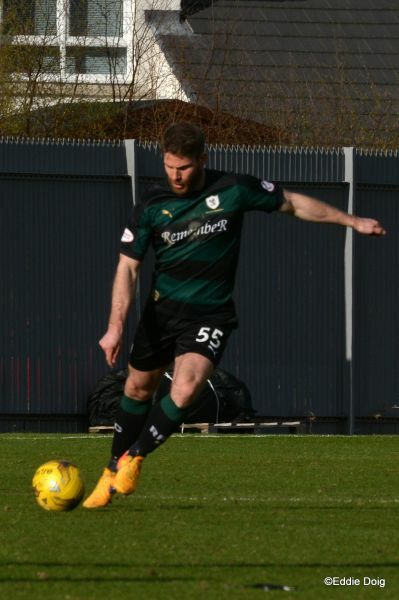 McKeown hits a left foot shot way over from 25 yards. Rovers playing into the low evening sun. 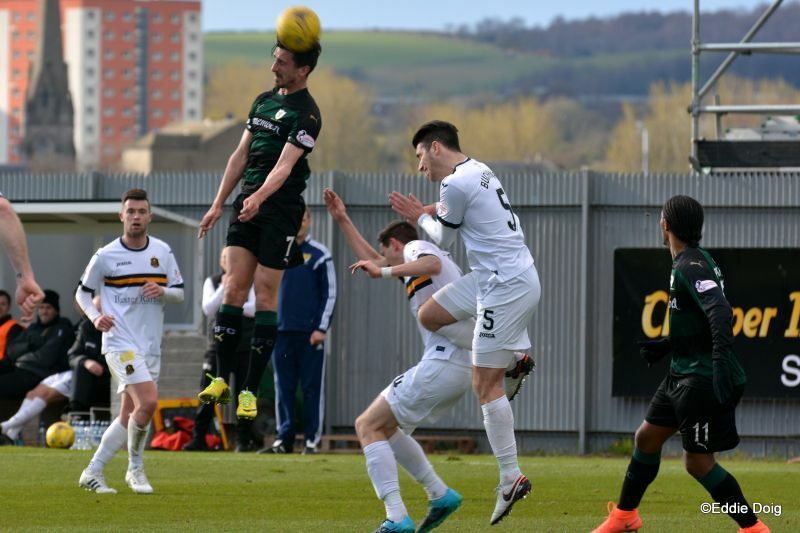 Fleming clattering McKeowan in a challenge. 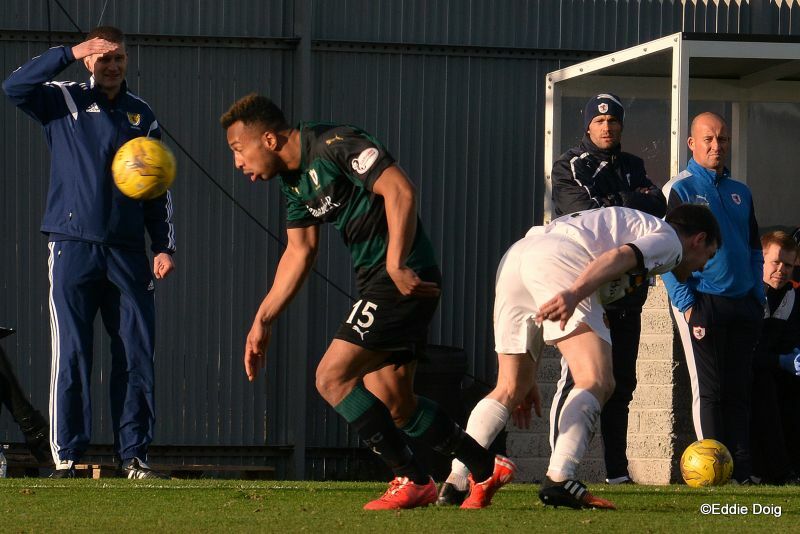 Ewings snatches the ball from Hardie. 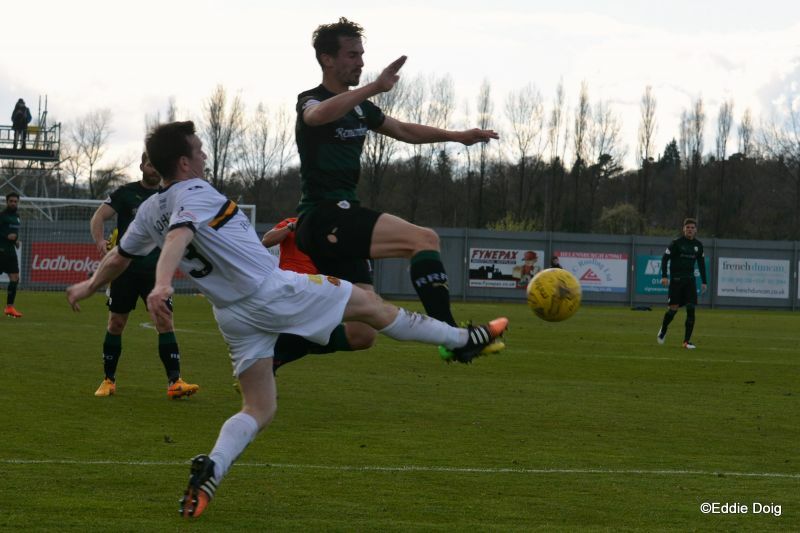 Ewings comfortably gathers Callachan's cross. 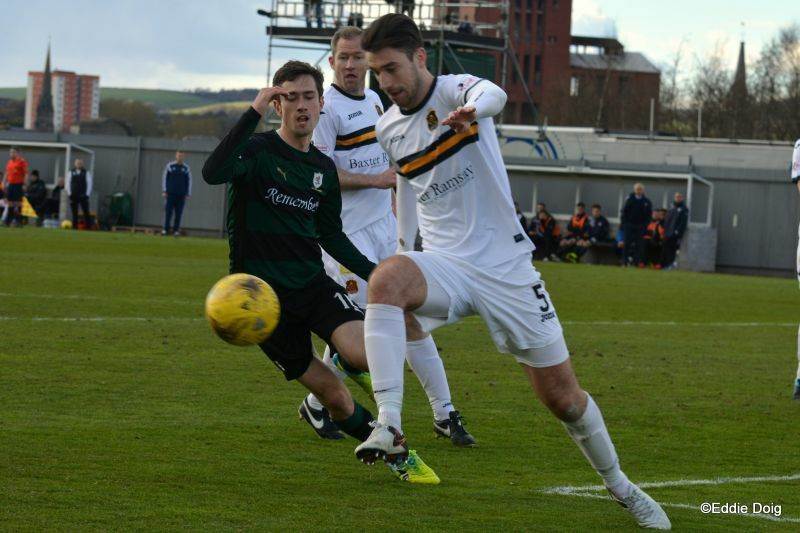 Ryan Hardie the recipient of a pass from Panayiotou trots past his defender and slots past Ewings. 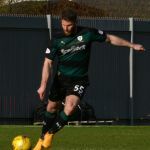 Cuthbert turns the ball round the post. Saunders swings in a cross, Cuthbert gathers comfortably. Saunders gets Anderson in a half Nelson and goes unpunished. 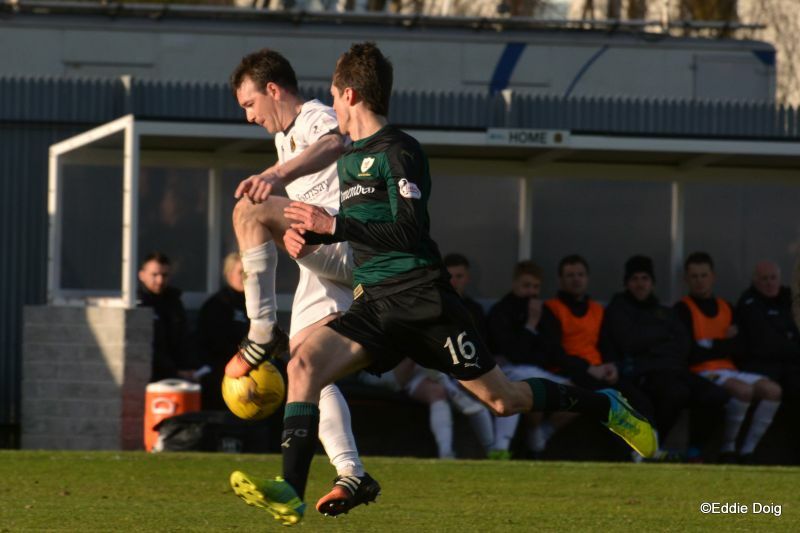 A wee back heel sets up Walsh who batters the ball out of sight way over the bar. 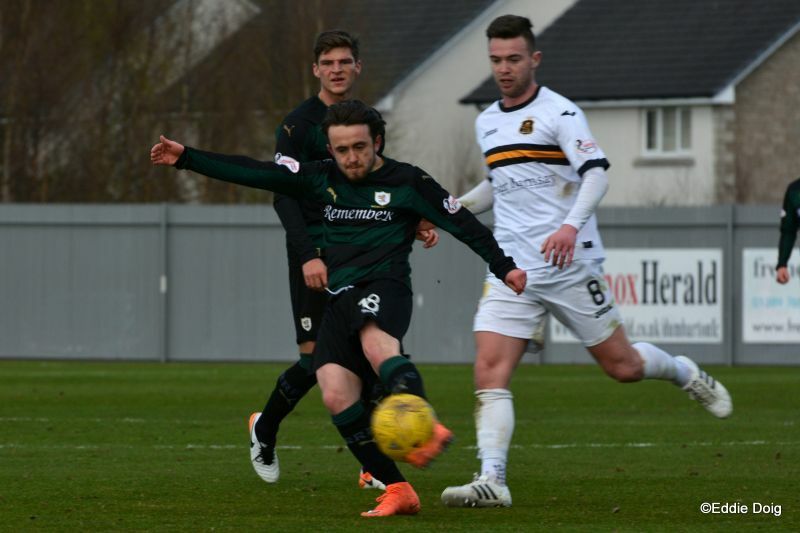 Connolly hammered the ball into the back of the net from 25 yards. Nade receiving treatment on the pitch. A couple of goals flattering Rovers judged on the first half, but they look comfortable now. Ray is having a frank discussion with the fourth official. Harry was ready to pull the trigger but watched as the ball flies past. 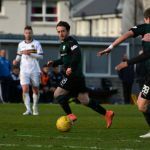 Connolly slips the ball through to Craigen who hits the back of the net from 15 yards. Harry glancing a header past the back post. Walsh shoots diagonally across goal and scraped the outside of the back post. 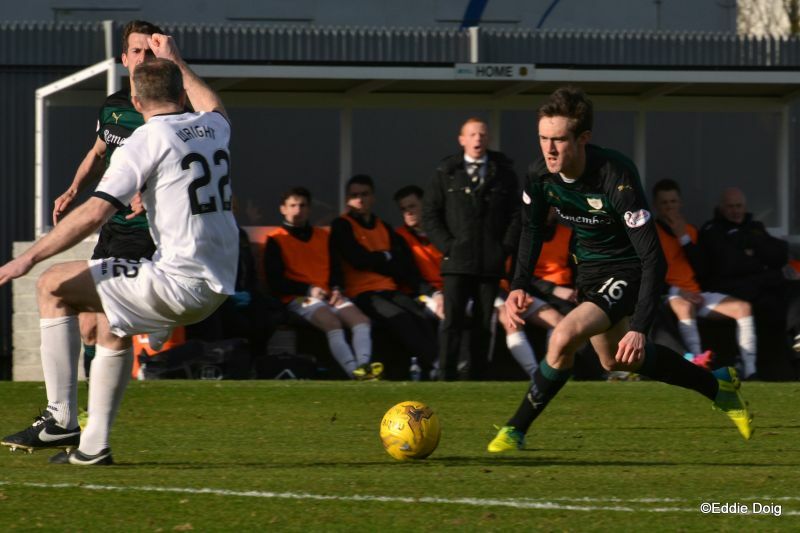 Docherty swings in a cross to Wright who nods the ball out of play. 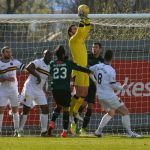 Benedictus yell for pulling down a player. 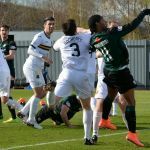 Benedictus on 7 bookings for the season, no worries for the play offs. Rovers players queuing up to shoot. 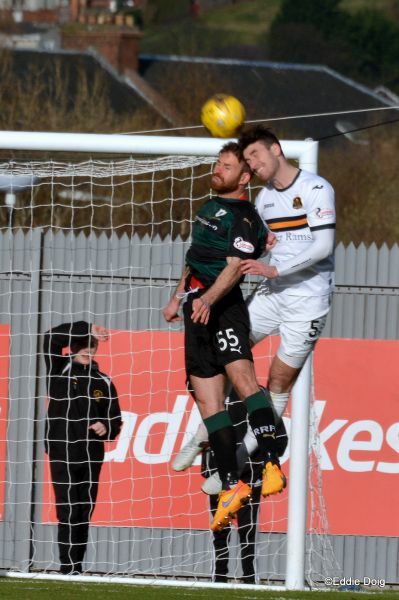 The defence could only watch as Docherty sent a high ball across goal. 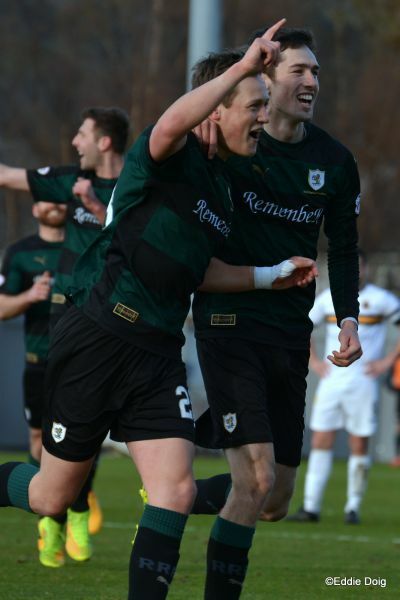 +2 Goal Dumbarton. Saunders with a header from a corner. +3 Comedy as Ewings hits the ball off Thomas and it heads goalwards. Ewings, Docherty, Saunders, Buchannan, Fleming, Gallagher, Routledge, Lindsay, Walsh, Wright, Nade. Subs, Taggart, Barr, Cawley, McCallum, Waters, Heffernan, Brown. 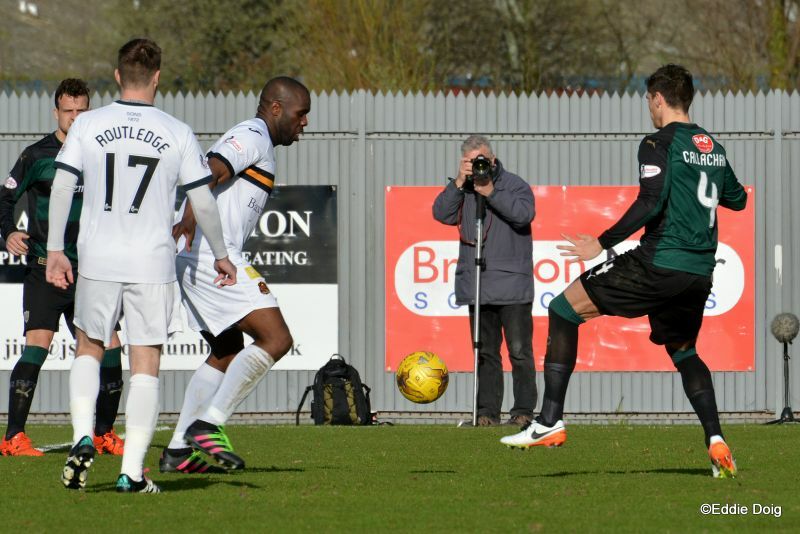 Cuthbert, Thomson, Callachan, Toshney, Benedictus, Anderson, Panayiotou, Hardie, Connolly, McKeowan, Barr. Subs, McCord, Matthews, Thomas, Longridge, Court, Craigen, Law. 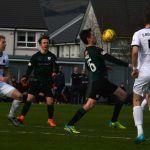 With Raith Rovers play-off spot now assured, Ray McKinnon’s men head to the Cheaper Insurance Direct Stadium this weekend looking to sustain their excellent run of form. 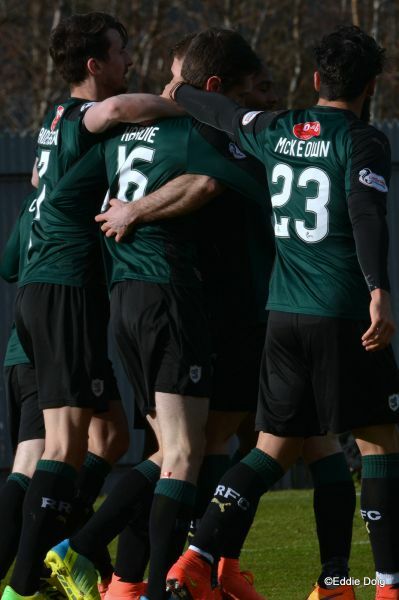 Saturday’s 2-1 win against Queen of the South at Palmerston Park made it six wins and two draws from their last eight outings, the team’s longest unbeaten league sequence since the 2013, when Grant Murray’s team made it ten without loss between August and October. 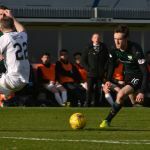 Whatever the result this Saturday, the match will presumably struggle to cram in as many goals and drama as was shoehorned into Raith’s last visit in November. 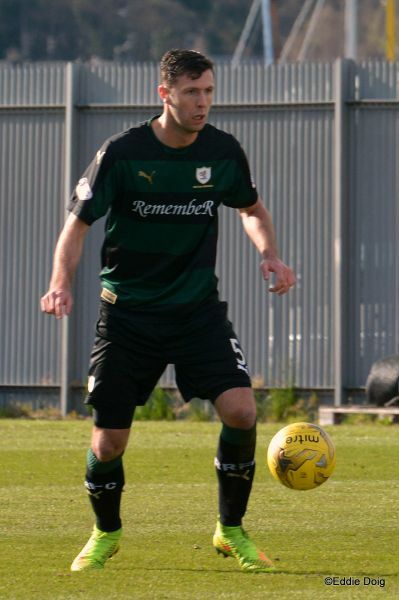 James Craigen gave Rovers an early lead, before Mark Stewart added another just before half-time. 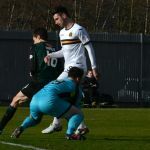 Scott Robertson appeared to have put Raith on easy street in the second-period, but two headed goals from Steven Saunders and a late penalty from Garry Fleming, handed Dumbarton a point which at one stage couldn’t have looked any less likely. 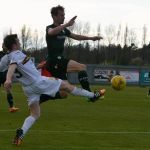 The two meetings at Stark’s Park this season have featured far fewer goals, with the last match in January ending 0-0, while Raith came out on top with the only goal in September, thanks to a header from Lewis Toshney. 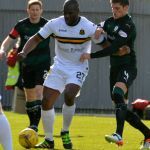 One very familiar face in the home ranks will be Christian Nade, who has been in exemplary form since signing for Dumbarton at the end of January. 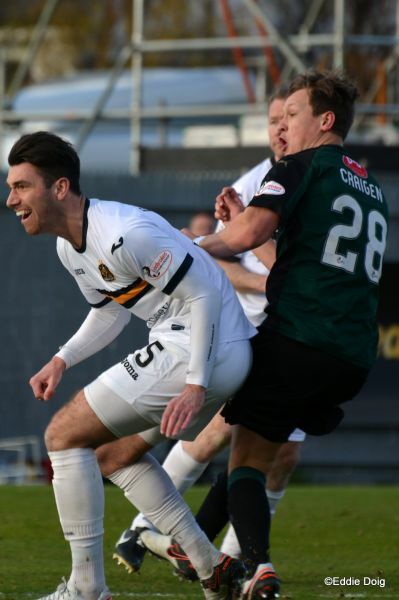 His two goals in the midweek win over Queen of South made it seven goals in just 11 appearances for the Sons, with the Frenchman already proving to be something of a cult figure amongst the Dumbarton support. 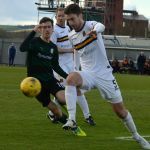 A win for Dumbarton would almost certainly secure their place in the second-tier for another season, while all-but condemning Livinsgton to ninth place in the process. 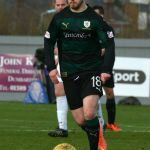 For Raith on the other hand, three points would narrow the gap between themselves and Hibernian to just a two points, and with third place guaranteeing a home tie in the second-leg of the playoff, snatching the position from under Hibs nose could hand Raith an advantage in the event of a play-off tie between the two. 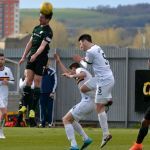 Rovers have a good recent record against Dumbarton in recent seasons, with four wins and four draws from their last ten meetings. 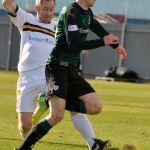 Saturday evening’s match referee will be Nick Walsh.